We tested out a slew of these motorcycling apps, and found the best of the best. Whether you're looking for the fastest or most scenic route, need an accurate weather forecast, or just want to find a great place to eat on a ride… there's an app for that! EatSleepRIDE – If you're looking for one app tailored specifically toward motorcycle riders that can "do it all," this is the one. 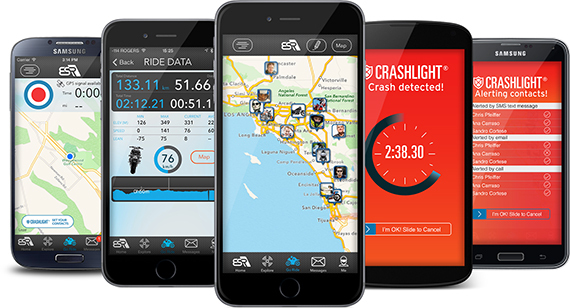 After years of other apps being developed for various other aspects of riding, like route sharing and planning, ride replay, group ride tracking, and so on, EatSleepRIDE took all the most in-demand features of all of them and made one "suite" just for riders. The app has an awesome user interface and a whole host of features that are perfect for motorcycling, like being able to track, save, and share your rides, replaying your rides with speed, elevation, and lean angle, allowing you to discover new routes submitted by other users, and more. The coolest feature, however, is CRASHLIGHT, which uses your accelerometer to detect if you’ve crashed while on your motorcycle and then sends an automatic emergency alert to your pre-selected contacts along with your exact location. Dark Sky – This unique app uses not only government-sourced radar information to provide extremely accurate weather forecasts, but it also uses crowd-sourced data from users to give constantly updated, ground-level reports. 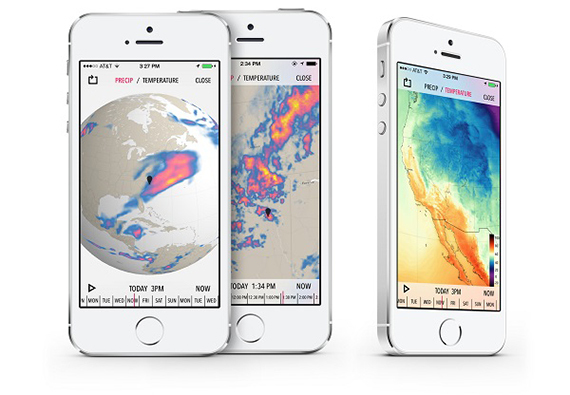 It can even automatically report data using the built-in barometer on the iPhones. 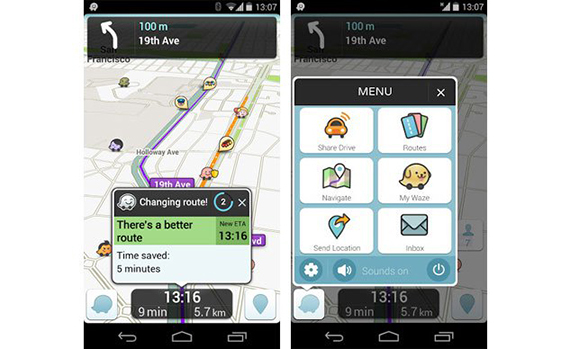 Waze – The world's largest community based traffic and navigation app, Waze shares traffic, road condition, and route info in real time to give you the most efficient way to get to your destination. It is a commuting app that was developed by and for drivers, but the ecosystem is so large, and the data so current, motorcycle commuters are sure to benefit from it as well. It may not give you the most scenic touring route or the best place to scrub off your chicken strips, but it will help you get to your destination fast for those Monday-Friday rides. It can also sync you up with other riders, and even find the cheapest places to find gas on your route! 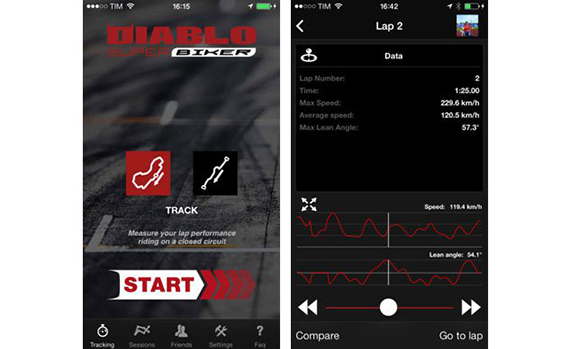 Pirelli Diablo Superbiker – Created for racers and track junkies, this app is a free alternative to expensive data acquisition equipment. Using your smartphone’s GPS and accelerometers, the app tracks your laps, speed, lean angle and lap times, plotting different parameters on a graph so you can see what you’re doing and where you’re doing it. There’s even a map feature with outlines of the course so you can piece together portions of track with the data being thrown back at you. Camp Where – This one is for the adventurers who like going off the beaten path. 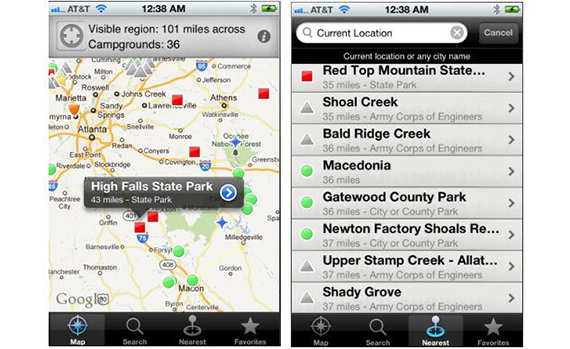 The app gives detailed information on more than 11,500 public campgrounds in the United States and Canada, including national parks, national forests, state parks, state forests, Canadian provincial parks, and county and city campgrounds, all accessible by car or motorcycle. Coordinate information is available for each campground, allowing you to input exact directions into a GPS device. Camp Where even provides information like phone numbers, reservation info, and weather information so you can make an informed decision on which campground to ride to.